AKVIS ArtWork v.7.0: Photo to Painting Software. New Gouache Effect! June 5, 2012 — AKVIS announces the release of ArtWork version 7.0. The software applies different painting techniques to digital photos. Available in Mac and PC versions as a standalone program and a plugin for Adobe Photoshop, ArtWork helps users to create a masterpiece out of an ordinary photo. Version 7.0 introduces the Gouache style that lets creating a gouache painting from a photo. Also, the new version adds the preview images for the AKVIS presets. The update is free for all registered users. Would you like to do something special with your photos? Would you like to express artistic talent without the years of time it takes to become a master? Try AKVIS ArtWork and transform ordinary photos into works of art. AKVIS ArtWork is truly the perfect virtual artist which can create images in various painting styles. The program combines advanced painting techniques with a touch of an artistic approach to digital photographs, making your pictures look as if they were real paintings. With ArtWork you can transform a photo into an oil painting, create an image in the style of comics, make a pen and ink drawing, a watercolor painting, or even a linocut. You can create a piece of art out of any digital photo: an oil portrait of your friend, a landscape watercolor painting, a funny poster with your dog or even an impressive linocut print to decorate your bedroom. The transformation of a digital photo into a painting happens before your very eyes, so you can follow the birth of a work of art in real time! 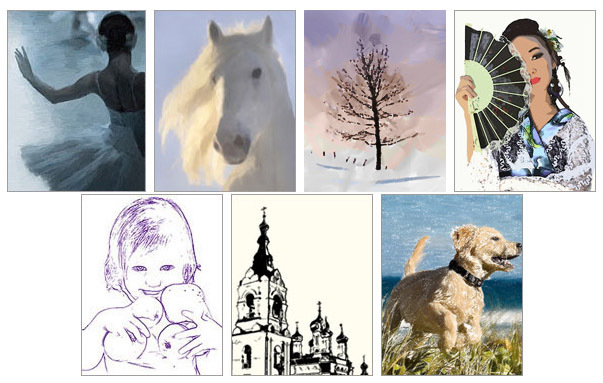 ArtWork offers a wide choice of canvas and artist's signatures to make your painting a finished product, ready to be printed poster-size and hung onto a wall. Make your loved ones a perfect gift of art! Many photo editing enthusiasts have already expressed themselves using ArtWork’s features. Take a look at the ArtWork Gallery. "By using AKVIS ArtWork one has the opportunity to realize their creative ideas, it's not just a painting program − this is a serious creative tool." (Andrey Terebov). Version 7.0 of ArtWork introduces the Gouache style that lets you create a gouache painting from a photo. It can also make an image look like a tempera picture. Gouache is a versatile painting technique which uses dense intensive colors. Its characteristics are brilliance and opacity. The opacity feature and covering power allow you to create outstanding effects that can not be achieved with the watercolor paints. This technique is widely used in decorative painting and when creating color sketches and drawings. Now the software offers seven painting techniques: Oil, Watercolor, Gouache, Comics, Pen & Ink, Linocut, Pastel. Each effect includes a number of ready-to-use presets which will help you to quickly create paintings and drawings in a variety of styles. Version 7.0 adds the preview images for all AKVIS presets. This feature saves you time and makes the choice easier. Registered users of ArtWork can upgrade to version 7.0 for free. AKVIS ArtWork is available as a standalone application, as well as a plugin to a photo editor (Adobe Photoshop, Corel Paint Shop Pro and others). The software runs on Windows XP/Vista/Win 7 and on Mac OS X 10.4-10.7, both 32 and 64 bit. AKVIS ArtWork, Home license, sells for $72 USD, downloadable from akvis.com. Visit the official website to see prices for alternate versions of the software and special offers.